One Wheel in the Furrow | Bringing Britain's engineering past to the present. It’s been some time since Michael and my good self have even logged onto our blog. Since then Michael has progressed from further education and into a career in agriculture (a cushy, clean office job) I was thinking the same, plonker. 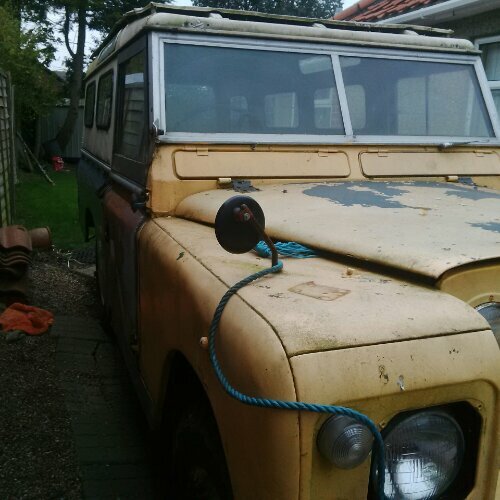 Give him his due, as his every day driver which happens to be a series 3 Land Rover is currently stripped naked and undergoing a chassis swap, so he’s still getting dirty. 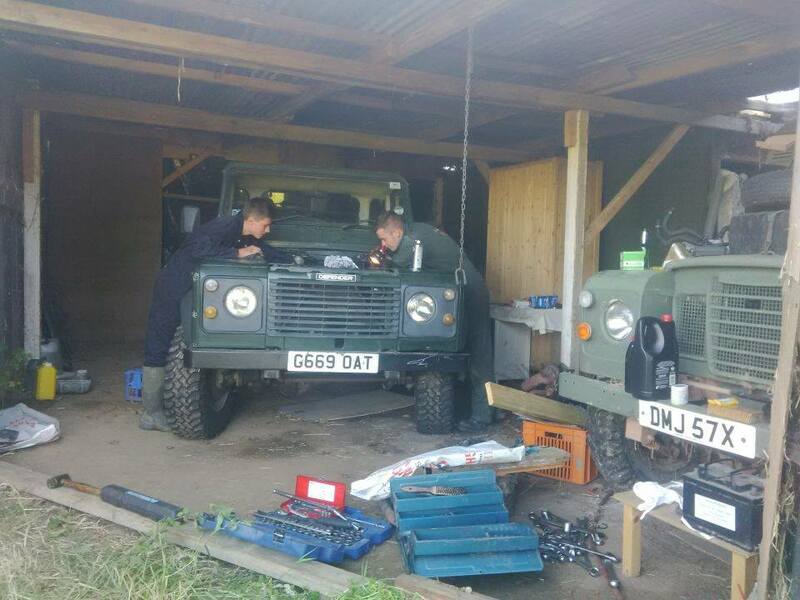 Mikes Series 3 has been a good workhorse, it regularly made the trip to and from our homeland of Norfolk to Shropshire where he used to study. I even had the pleasure of joining him and his peers on a road trip and a greenlaning session in Wales at gwiynibsjadbrhrbtbiswyth, or somewhere to that nature. Being a proud flatlander I’d never traversed across moors, up hills and fast flowing streams. There were 16 vehicles ranging from a 107″ Series 1 with a 2.5 na engine to a P38 Range Rover. The latter had an argument with a dry stone wall on one track, due to the self levelling suspension. Almost exactly a month ago my dear girlfriend was kind enough to drive me 379 miles at the drop of a hat to south west wales (I’ve now been to Wales twice, both trips Landy related.) 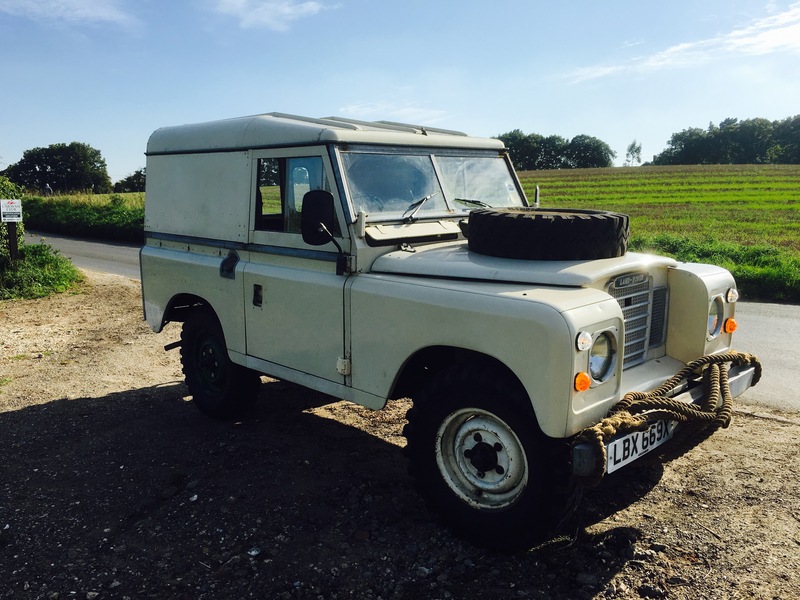 The reason for this foray into the land of rugby, sheep and leeks was a tidy series 3 88″ petrol that had caught my eye for sale on Facebook with a years MOT for an extremely reasonable price. So I paid the l kind old chap the asking price as she was extremely original and had only had 2 owners from new. I began to drive her to the local village for a quick meal before the lady and I attempted to drive home in convoy. I certainly could not wipe the huge ear to ear grin off my face, driving a series again made me realise how foolish I was to resort a plastic, electric and comfortable car. These classic beauties ooze sexines and character. Anyhow, after dinner I began to meander the narrow roads up, down and around hills toward the border. 2 miles out of the village the ignition decided to play up big time, I pulled over and called it a day. So I had a lovely 356 mile ride home in an RAC Lorry. On return to Nelson’s County I had to running sweet in less than half an hour of pushing her I the drive. It’s been one sweet ride ever since and I’ve covered a few hundred miles since then. I plan on keeping her original and touching up all those small jobs to keep her as near tip top as I can. Many thanks to Clint Henderson at Partcatalog.com for sharing this link with me. Partcatalog asked over 1,100 off road clubs what there favorite trails were in 39 states across the pond. The result is an excellent example of off road destinations across America. I just couldn’t keep myself from owning a Land Rover any longer. She may be tatty, but i’ve only got to sort out a few niggly problems with the brakes and fit new electrics. Those twin leading shoe drum brakes on the front are a pig! 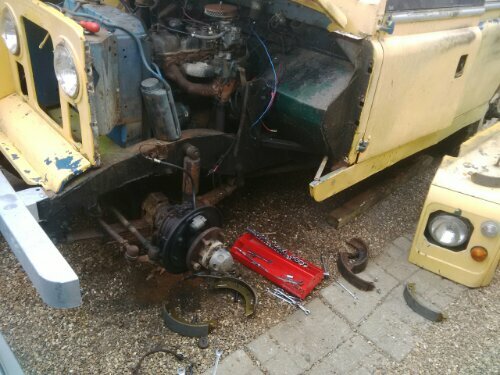 I originally planned on only fixing the problems with the brakes that needed it, but fortunately Paddock’s Land Rover Spares sell a break overhaul kit at an extremely good price. The kit includes shoes all round, adjusters, springs and slave cylinders, Bargain! I acquired this today, she’s a big lump. Not sure exactly how much it weighs, but I’ve most probably knocked a few years of service life out of my vertebrae whilst attempting to fit it. Bolts are hard to come by for these, luckily Mid Norfolk Tractors have reproduction bolts available, correct head size and all! 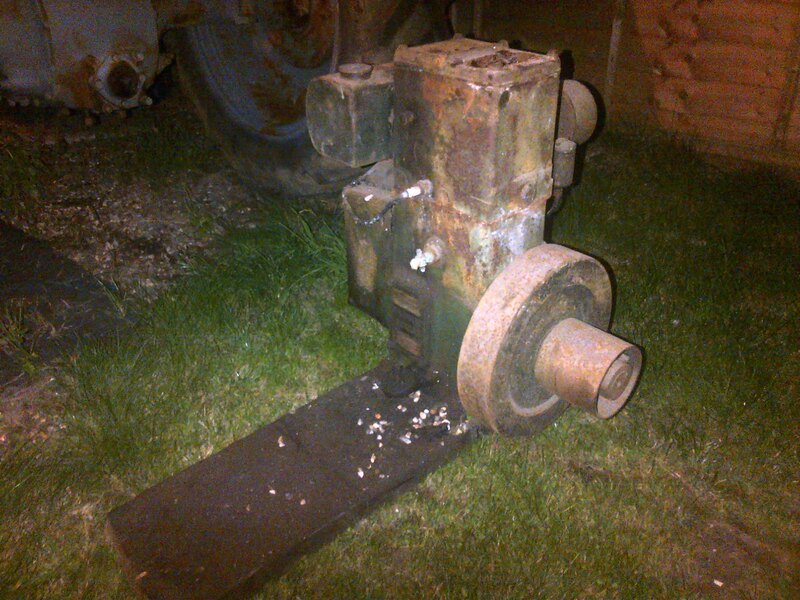 Next just is to take a look at my pump, piston and valve block. Something certainly isn’t right with my linkage. 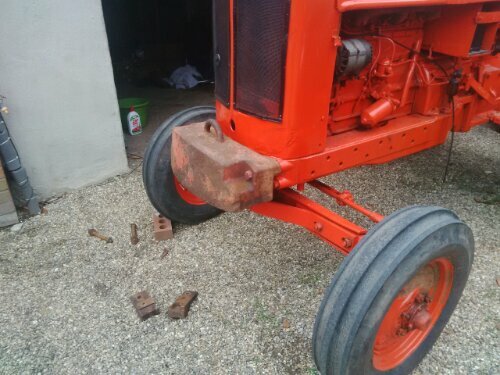 She struggles to lift the TS82, linkage sometimes won’t drop, to name but a few problems…….. I think I collect too much rubbish! starting handle pin sheared off and engine seized! Hasn’t run for 40 odd years. “I’ll do that up one day” says I……..